Pouch Packaging Machine manufactures pouches which are used for transportation and shipping of consumer goods as well as industrial goods. Flexible packaging market is growing and stretches its boundaries into food, beverage and medical applications. Packaging machinery is used for a wide variety of functions that includes canning, container cleaning, filling, and forming, bagging, packing, unpacking, bottling, sealing, and lidding; inspection and check weighing; wrapping, shrink film, and heat sealing, case forming, labeling, and encoding; palletizing and DE palletizing. Pouch packaging machine play a vital role in ensuring product safety throughout the supply chain. 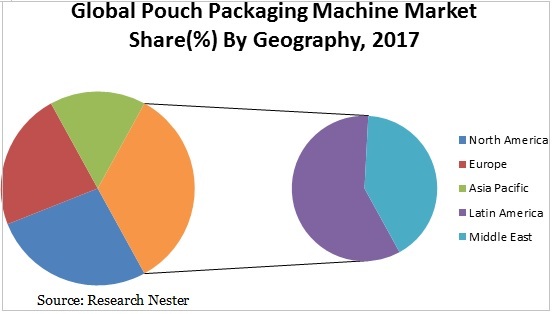 The global pouch packaging machine market is expected to showcase a significant CAGR of 7.1% during the forecasted period 2018-2027. Additionally, the global pouch packaging machine market is thriving on the back of rising consumer demand of packed goods. Pouches are flexible packaging systems commonly used commonly for packaging liquid products. Increasing consumption of dairy products is expected to increase the market size of pouch packaging machine over the forecast period. The global pouch packaging machine market is primarily driven by consumers buying habits are changing with development in new technology and trends which affect the market. Additionally, growing use of pouch packaging machine for packaging of dairy products is a major factor which is expanding the market size of pouch packaging machine across all regions. Strict government regulations and procedures such as Food and Drug Administration (FDA) in some of the countries have led a positive impact on pouch packaging machine which are further likely to bolster the growth of pouch packaging machine market in future.Contrariwise, production of high quality pouch packaging machine is costlier along with strict testing procedure which may dampen the growth of pouch packaging machine market globally. Additionally, presence of other alternative packaging solutions and volatility in raw material price are key challenges which may have negative impact on the growth of global pouch packaging machine market over the forecast period.